The back of the book says this is written "in the tradition of Nicholas Sparks." I'll be honest. I've never read a Nicholas Sparks book. 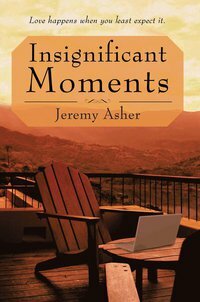 But I know his books are very popular, so if you like him, you should definitely pick up Insignificant Moments. Although inspirational (in a non-religious way), this book is a very easy, enjoyable read. The characters are all well developed and likable, and the story, while somewhat predictable, has enough surprises to make it interesting and satisfying. For more information, check out Jeremy Asher's website. This review was written based on a copy of Insignificant Moments that I received from BohlsenPR in exchange for an honest review.